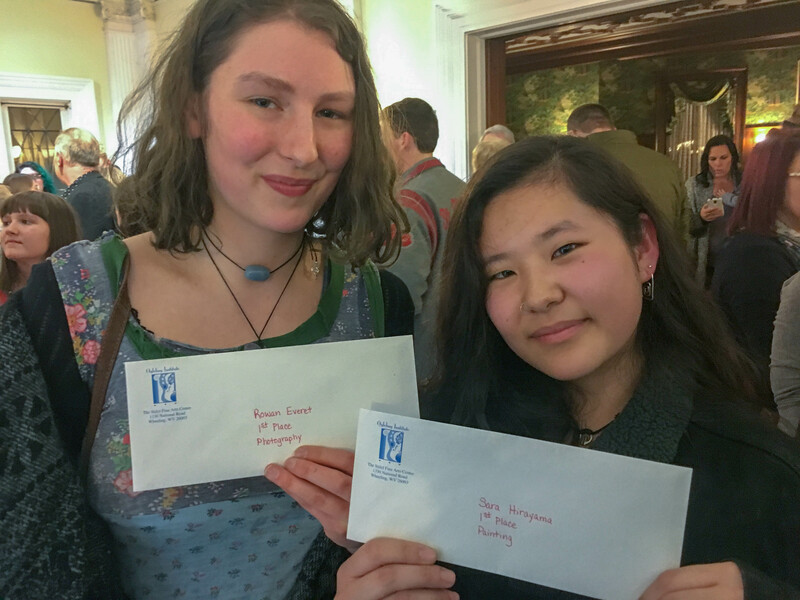 Two Olney Friends School students won first place in Oglebay Institute's Stifel Fine Art's Center's 30th Regional Student Art Show. Rowan Everet, senior, won first place in the photography category for her piece titled, "Girl Behind the Fig Tree". Sara Hirayama, senior, won first place in the painting category for her work titled, "Strawberry Dragon". Seven students from OFS submitted their creative artwork to OI's Art Exhibition. Of those seven students, six were accepted and invited to the Stifel Fine Arts Center on January 10, 2018, where there was a public reception and awards ceremony. 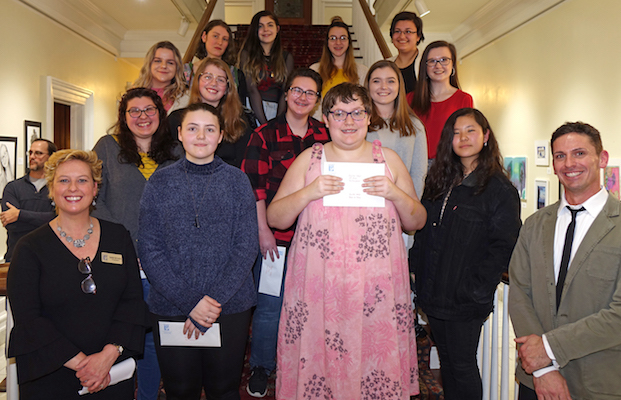 The student winners in each category received cash prizes and several scholarships were offered to students from West Liberty University and West Virginia University. OI staff and student winners. Image by Oglebay Institute. According to Oglebay Institutes Facebook, "The exhibit provides high school students the opportunity to display their artwork in a professional gallery, see what other students are doing in the world of art and collaborate and get feedback from art teachers, college professors and other students from throughout the region." This year, the exhibit was judged by freelance illustrator John Blumen. Rowan Everet with her piece, “Girl Hiding Behind the Fig Tree.” Image by Oglebay Institute. 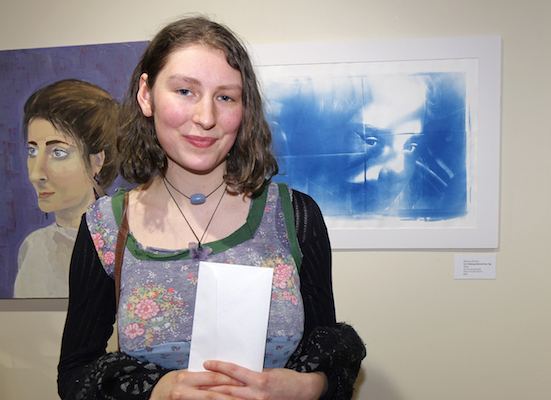 Rowan's piece was a cyanotype featuring a former student, Zora Dahme, hiding behind a fig leaf in Olney's greenhouse. Because she could not make one big negative of her photo, her piece is comprised of smaller negatives, which resulted in the distortion of the student's face and added to its overall visual appeal. When Rowan was asked about her win, she stated, "I was surprised. They were going through them [the winners] and I was disappointed because I didn't get 2nd or 3rd place, and then they started describing the photograph... Then they said my name and I was like, wow." 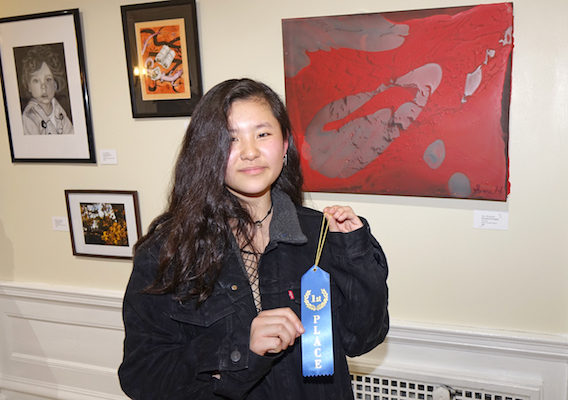 Sara Hirayama with her painting, “Strawberry Dragon.” Image by Oglebay Institute. This was the second time Sara Hirayama had placed in OI's Regional Student Art Exhibition. Last year, she won 3rd place in the photography category; a category that she was hoping to win again this year. While she was sad that her photography didn't place, when her name was announced as the first place winner in the painting category, she was surprised and happy. Sara's painting was inspired by a 5 year old girl who makes works of art by dripping paint on a canvas. However, since Sara didn't want to waste paint, she mixed glue and paint together and dripped the mixture on a canvas instead. "It was fun, but messy...and it was interesting when the glue was drying. It just kept on changing," Sara said when describing her piece. The Student Exhibition is free to view now through February 15th at Oglebay Institute’s Stifel Fine Arts Center, located at 1330 National Road in Wheeling, WV. Visit www.oionline.com or call 304-242-7700, for more information.